Description: The IDAutomation .NET Barcode Font Encoder Assembly & DLL is a Font Tool that is used to format strings for IDAutomation Barcode Fonts in the Microsoft .NET Framework. This product supports all standard barcode fonts as well as the Universal Font. This product is royalty free with the purchase of a Developer License and above to one of the IDAutomation Barcode Fonts. Description: This IDAutomation integrated drag-and-drop Custom Report Item (CRI) control creates Linear and 2D barcodes in Microsoft Reporting Services, without the use of barcode fonts. Designer and Render DLLs provided are created in C#, digitally signed and time-stamped with Authenticode certificates. This package includes installers for Reporting Services SQL Server 2005 and 2008, as well as report examples. Description: The IDAutomation Universal 2D Barcode Font is a single font file that is used to generate two-dimensional barcodes from Aztec, DataMatrix, PDF417 and QR-Code font encoders. Includes examples for Visual Basic, Microsoft Word, Excel, Access, Filemaker Pro and Crystal Reports. With a purchase of the Developer License or above, a full set of Web Fonts are included in WOFF, EOT and SVG formats. Description: This professional grade application is used to easily create and paste 2D DataMatrix, Aztec, QR Code, PDF417, Maxicode and many popular Linear barcodes into other Windows applications or generate high quality graphic image files. Command line options are now supported in this new version. Commonly used with PhotoShop, Quark and Publisher. Settings and properties of the barcode are retained for ease of use. Description: Create Data Matrix barcodes in i-net Clear Reports without installing additional fonts or other components with the IDAutomation Native Data Matrix Barcode Generator. Description: The Native Linear plus 2D Barcode Generator for Microsoft Excel provides barcoding capability to Microsoft Excel Spreadsheets with an embedded VBA macro making it easy to share sheets without needing to distribute additional fonts or other components. Compatible for both Microsoft Windows and Mac OS X, 32 and 64 bit systems, for Microsoft Excel 2003 and greater in Windows and Excel 2011 and greater on Mac with VBA support. 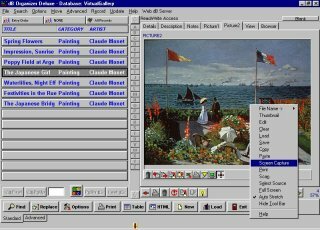 Description: Art and Antiques Organizer Deluxe is a Windows software for private and corporate collectors, small galleries, dealers, artists, publishers, appraisers, small museums, and clubs. Software helps you to organize, catalog, and manage all art and antique collections. Organizer is intuitive and easy to use for the beginner, at the same moment feature-rich and powerful enough to satisfy the most advanced users. Description: Generate linear barcodes in web-based applications with the ASP.NET 1D Barcode Generator. Insert a call to an ASPX script file, located on a local or hosted ASP.NET enabled web server, in any application where barcodes are needed. Each symbology has its own ASPX file in pure ASPX source code form that can be modified with different parameters.